Even in its absence, ice rules land and sea. The unmistakable signs of its power and influence are seen in the planet’s landscape, and in the cycle of water, wind, ocean currents, and climate. Penetrating south overland towards the middle of North America during the last ice age, the ice retreated northward again in its slow-turning geologic oscillation leading to the interglacial period in which we now live. It is within this period of relative warmth and stability in Earth’s climate that all human experience exists. Just as humans began organizing an agrarian society about ten thousand years ago, global temperatures plateaued and began naturally tapering towards the next ice age. That is, until the unmistakable signs of human activity upset Earth’s natural climactic cycle. One of the first, omened signs of that influence lay in the rapid acceleration of changes in the world’s ice. If you live on Earth, your fate is tied to the ice, and the ice is melting. 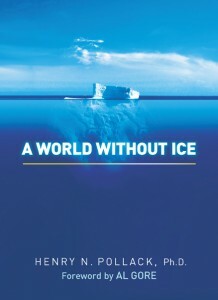 Dr. Henry Pollack’s new book A World Without Ice tells the story of ice and human civilization’s relationship to it. 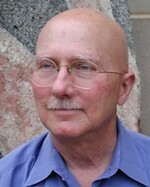 A professor of geophysics at the University of Michigan, Dr. Pollack combines a formidable and wide-ranging scientific understanding of Earth and climate with an engaging literary style. Despite the complex and grave nature of the issue at hand, Dr. Pollack gives a captivating explanation of how ice drives the delicate balance of Earth’s climate, and how that balance has been knocked off kilter by human activity. Step-by-step, Dr. Pollack lays before the reader the unmistakable signs, effectively refuting the endless litany of the “climate contras” and their “trenches of denial.” But A World Without Ice is no polemic. It is a clear-headed account of the situation in which we now find ourselves – unwittingly at first, but no longer. The signs are manifest and growing. Action cannot be left to future generations; doing so is to forgo the moral imperative of those who would see the signs and choose to ignore them. So Dr. Pollack calls, in the end, for a Churchillian optimism, that of “finding opportunity in every difficulty” as we chart a course toward a sustainable future. The challenges we face are immense, and thus so is the opportunity – but only if we choose clear-headed action over small-minded denial and self-interest. The choice is ours now to make. A World Without Ice is an important book for anyone truly interested in making the right choice. 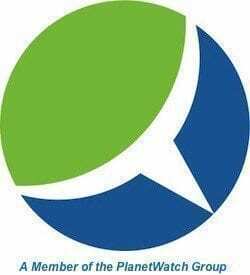 Global Warming is Real.com is a first stop on the virtual book tour for Dr. Henry Pollack’s A World Without Ice. Thank you so much for the time spent reading and reviewing this book. It is very much appreciated!